Tuo Jiaxi (柁嘉熹, tuo2 jia1 xi1, b. January 15th, 1991) is a Chinese 9-dan professional. Tuo became a 1-dan professional in 2002, 2-dan on 2004-07-19, 3-dan in 2005-07 and 9 dan in 2014-02-13 (winner of the 18th LG Cup). At the end of January 2013, he was tied for #1 with Gu Li in the Chinese ranking 2012; then was the only #1 from the Chinese ranking at the end of March 2013. 2007, winner of the Fujitsu Under 15. 2010, winner of the Chang-ki Cup, defeating Zhou Ruiyang 2-1. 2012, winner of the CCTV Cup (a.k.a. Cina CITIC Bank Cup), defeating Lian Xiao. He was a member of Chinese Team in the 10th Nongshim Cup; where he won four games, finally losing to Korea's Kang Dongyun. Runner-up in 2012 in the 4th Longxing (lost to Mao Ruilong 2-0). Runner-up in 2013 in the 1st Luoyang Longmen Qisheng (the richest Chinese title. 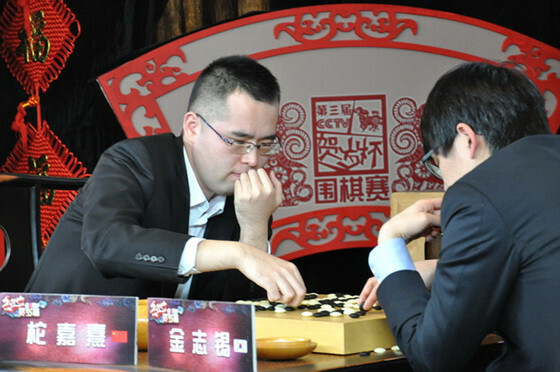 Tuo won the first 2 games, but lost 2-3 to Zhou Ruiyang). Runner up to Ke Jie in 21st Samsung Cup.